Один из самых фундаментальных трудов по христологии апостола Павла знаменитого библеиста Гордона Фи. Hendrickson Publishers, Inc., 2007. - 707 s.
At the end of this lengthy analysis of texts in both Paul and the Wisdom literature, we may conclude with a considerable degree of confidence that Paul neither knew nor articulated anything that might resemble a Wisdom Christology. I now emphasize this conclusion by summarizing the various points that have been made throughout. 1. This view could never have arisen on the basis of the Pauline texts alone. On no occasion does Paul say, or hint at the possibility, that Wisdom was involved in God's creation of the world. On this matter, he does not even echo the wisdom texts that speak of creation reflecting God's attribute of wisdom. 2. What Paul says, rather, is that all things that God created came into being through the agency of Christ, either as the Lord or as the divine Son. 3. Furthermore, there is nothing in Paul's use of the wisdom tradition that would lead anyone to look for personified Wisdom in what he does say either about Christ or about creation. A careful analysis of Paul's actual use of the wisdom tradition would scarcely cause one to look there for a christological resolution to Paul's understanding of Christ. 4. The absolutely crucial document for finding a tie to Paul and the Wisdom literature is Wisdom of Solomon. But an analysis of all possible allusions to this work in Paul's letters offers little confidence in this regard. Indeed, nothing in Paul's letters indicates that he knew of its existence; and even if he did know of it, he made no obvious use of it. 5. On the other crucial matter—whether in the wisdom tradition itself there is a tendency to view personified Wisdom as the agent of creation— careful exegesis of the various texts in the context of the whole document does not lead one to think that this was the view of any of the authors of these books. 6. What is startling when one reads the literature on this matter is the nature of the advocacy for such a view, where everything brought forward in support requires a methodology totally unlike anything else that one would use for constructing a Pauline theology, which ordinarily is constructed on the basis of what Paul actually says on a subject and recognizes the value of от supporting evidence. But here, by way of contrast, every bit of "evidence" brought forward is by way of secondary (or even tertiary) allusions. That is, Paul himself never even remotely associates Christ with personified Wisdom. The only possible instance (1 Cor 1:24) has nothing to do with personified Wisdom but rather with "wisdom" at the human level, which has caused the Corinthians to reject the reality of a crucified Messiah. So when Paul says that all things were created "through [the Lord]" (1 Cor 8:6) and "through [the Son]" (Col 1:15) regarding his role in creation, it is certainly not Paul who intends us to read "Wisdom" for'"Lord" or "Son," but rather some NT scholars in their wishfulness to see it so. 7. 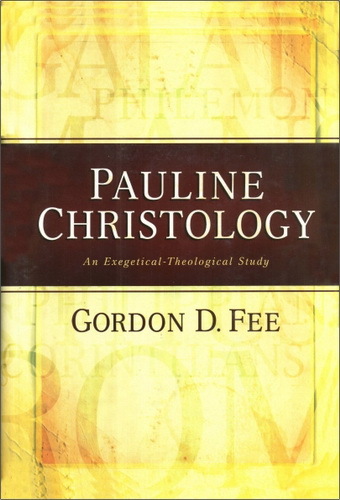 In light of the evidence, therefore, both in Paul's letters and in the Wisdom literature, we must conclude that Wisdom Christology is not found in Paul's letters and thus has no role in the reconstruction of Paul's Christology. Как жаль, что один из самых фундаментальных трудов по христологии апостола Павла так и не будет переведен на русский язык!